Located at Millstreet Country Park, County Cork are the remains of a megalithic complex consisting of a damaged 5 stone circle, best seen in the foreground of the image below, a radial cairn and what may be the remains of a fallen row. 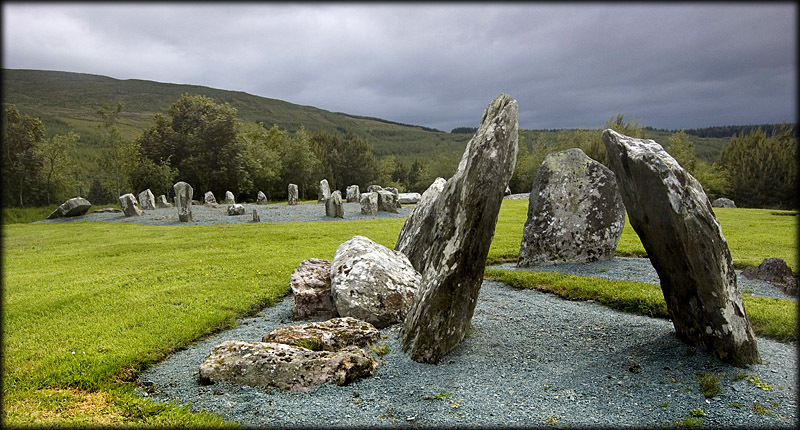 The two near stones below are the portals set radially to the pointed recumbent. The north-western side stone is broken with the top now lying between the SE side stone and the entrance stones. 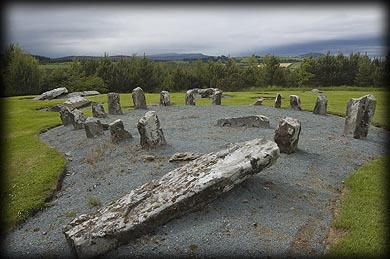 The radial cairn is located just south of the circle with a large number of low stones set radially. There are also other large stones lying around the site that could be from a fallen row. 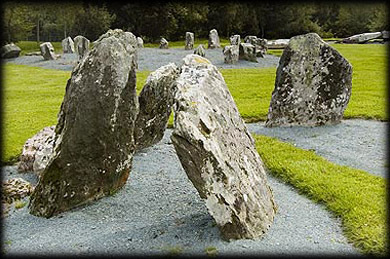 There are a number of megalithic sites in the Cork area that have similar these features Circle, Cairn and Row, Kealkill, Knockraheen and Knocknakilla only two kilometres from here, are amongst the best examples. Situated: In Millstreet Country Park, County Cork. Five kilometres south of Millstreet. From here travel east along the R583 then take a right turn for the Country Park (sign-posted) follow the signs for the Park, once inside it is a 10 minute walk to the site. To enter Millstreet Country Park costs €20 per car. I would suggest visiting the park with a party where they also have a reconstruction of a Crannog and Fulacht Fia. Discovery Map 79: W 3050 8530. Last visit June 2007.